Bill English’s set is beautifully detailed and creates a backyard hangout, with a picnic bench center stage, garbage bins on the right and a building at the back, complete with a porch, a screen door and even a hot water heater on the building’s side. Since the space is small, every aspect is up for scrutiny, and the intimate space puts us right in the backyard with the characters. Michael Palumbo’s lighting is equally effective, effortlessly alerting us to the time of day, whether it’s the warm July sun or the cool summer moonlight. When the play opens, it’s a calm, sunny summer afternoon. Jasper (Peter O’Connor) and KJ (Haynes Thigpen) are relaxing on the picnic bench outside. We will eventually learn that they aren’t in their own backyard, but actually trespassing on a restaurant. They aren’t looking at or talking to one another, but it’s perfectly relaxed and natural. It’s also silent for minutes, allowing us to adapt to the pace and the rhythm of the play. They eventually start to speak, though not really about anything, before they are ultimately interrupted by Evan (Brian Miskell), the sixteen-year-old who has just started working at the restaurant where they are. Evan is anxious when he discovers Jasper and KJ outdoors because customers aren’t technically allowed outside in the backyard, and he’s unsure what to do. Out of boredom or vanity, Jasper and KJ adopt the self-conscious Evan into their acquaintance, and it is through their discussions with Evan about each other that we start to discover their back-stories. Somewhere in the middle, the focus shifts onto Evan, and the play becomes a coming-of-age story. Evan is gawky and awkward. He speaks with trepidation and often stumbles over his words. He find Jasper and KJ’s attentions flattering; he’s not the sort who is used to being the center of attention of anything and mostly tries to fade into the background, both in high school and at work. “The Aliens” is all about the acting, and what a fantastic cast this production has. In his cut-off sweatpants and faded backpack, O’Connor as Jasper exudes a calm coolness. As KJ, Thigpen is goofy yet proud, and when we see him humming and singing to himself, it seems natural. These two can sit in extended silences together and what we feel is that these are the silences of two people who know each other well and do not need to be engaged in constant dialogue to feel comfortable. The standout performance is by Brian Miskell as Evan. Through vocal tics, posture and jerky movements, Miskell creates a neurotic and uncertain teenager. Miskell is completely present as an actor, subtly reacting to everything happening onstage and modulating his speech so deliberately that the stutters really do seem spontaneous. Everything registers in his face and his body so that, even when the action isn’t centered on him, its effects on him are omnipresent and distinguishable. 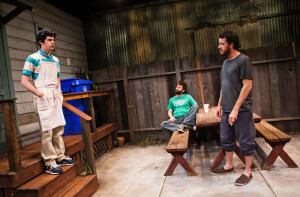 Despite the excellent acting, the play fails to reach much depth after the first act. Offhand comments stop being a huge window into the characters, and the interminable silences, albeit impeccably played, can feel very slow and test the audience’s patience. We are invited to scrutinize every detail to look for meaning, and while things begin by seeming meaningful in the first act, the second act fails to keep up. 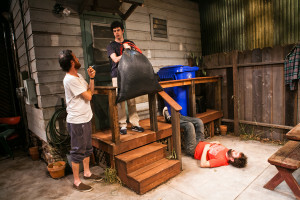 The play is technically skillful, and it is a rare treat to see three actors so intense and in such realistic banality. It’s just disappointing that it doesn’t offer more.